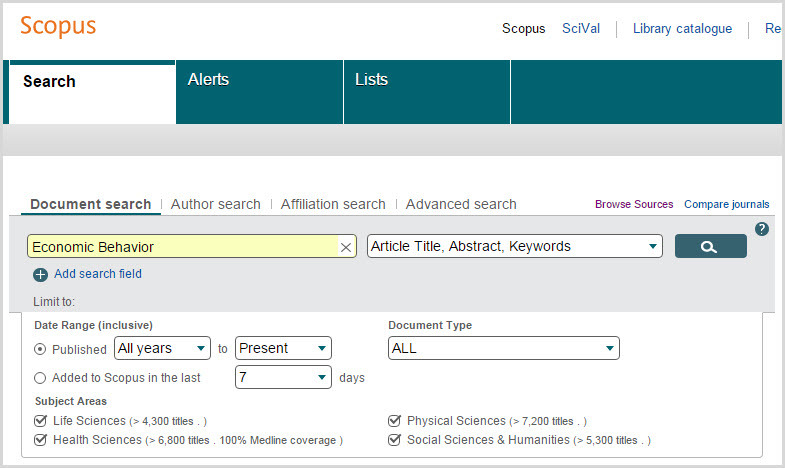 PlumX Metrics soon to be integrated on Scopus: How will it help you tell the story of your research? Since it was first announced in February 2017 that Plum Analytics was joining Elsevier, the Plum Analytics and Scopus teams have been working together to integrate PlumX Metrics as the primary source of article-level metrics on Scopus (along with other Elsevier platforms and products), replacing metrics previously provided by Altmetrics.com. With the integration now just around the corner, here is an overview of what PlumX Metrics are to prepare you for the type of insights you will soon be able to find on Scopus. Read more about PlumX Metrics soon to be integrated on Scopus: How will it help you tell the story of your research? For metrics to be understood and trusted, clarity into how they work and are calculated is important. When CiteScore was first introduced, we shared the methodology behind the calculation. Now we are taking transparency a step further by enabling anyone to validate any CiteScore value by clicking into the numerator (citations) and denominator (documents) for free. 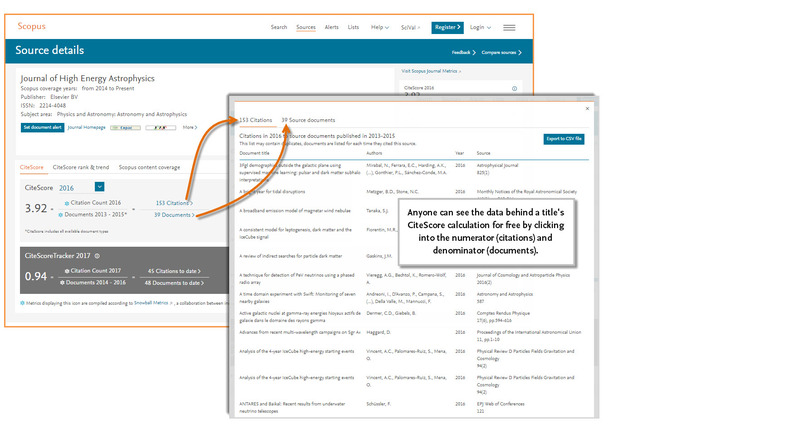 When viewing the Source details page for a title on Scopus, you can see the data behind the CiteScore calculation by clicking on either the citation or document count. This opens a window where you can toggle between the list of documents and citations. In addition, if you’re institution subscribes to Scopus and you are logged in, you can even export the information into a CSV file. Try it now. Go to JournalMetrics.Scopus.com to get started. While a metric like CiteScore provides a consistent way to track performance annually, CiteScore Tracker also shows how the current year’s CiteScore builds up each month — additional information that may be helpful when making decisions. How it works: CiteScore Tracker is calculated in the same way as CiteScore, but for the current year, rather than previous, complete years. The numerator (citation count) of the current year’s metric builds up every month as additional citations are received, so that the construction is consistent with the construction of the complete year CiteScore. Once the new annual CiteScore value is fixed, then the CiteScore Tracker for the next year begins and is displayed on Scopus.com. For examples, once CiteScore 2016 is fixed the CiteScore Tracker 2017 will also be initiated and available on Scopus. 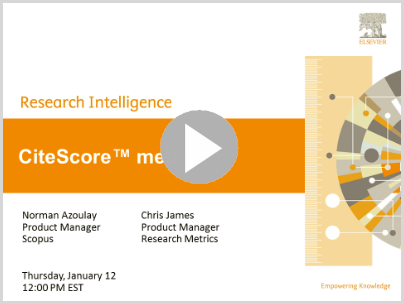 In January, we held a webinar on CiteScore metrics – not only providing an overview of what CiteScore metrics are, but also showing you how to access and use the new metrics. In case you missed it, the recorded webinar is available for you to view here. Take some time to learn about why CiteScore was created, how it is calculated and what it brings to the overall basket of metrics. Additionally, follow these tips to get started exploring CiteScore metrics. But, which one you begin with depends upon what you want to do. As the age of electronic publishing has matured, researchers, publishers, bibliometricians, librarians, institutional leaders and others in academia have been exploring ways to bring research metrics into the 21st century. Journal metrics continue to be important in the research community, alongside metrics for measuring other entities such as articles, researchers, institutions, subject areas, and so forth. Today, Scopus is expanding its basket of metrics by adding CiteScore™ metrics — a family of eight indicators that offer complementary views to analyze the impact of all serial titles — including journals — on Scopus. 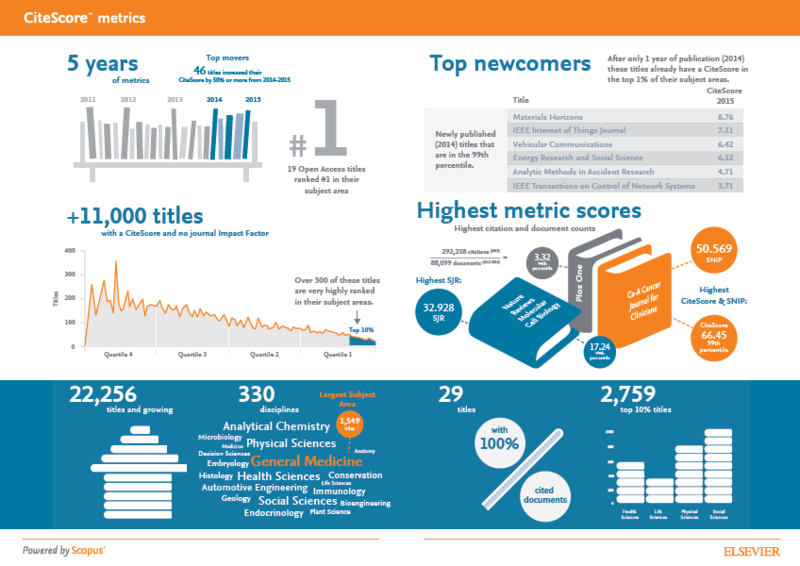 In a previous post we began looking at some of the metrics featured in Library Connect’s Quick Reference Cards for Research Impact Metrics and sharing how they relate to Scopus. The first post covered SCImago Journal Rank (SJR). Continuing on with the journal metrics theme, in this post we discuss Source Normalized Impact per Paper (SNIP). SNIP was created by Professor Henk Moed at the Centre for Science and Technology Studies (CTWS), University of Leiden. It measures contextual citation impact by weighting citations based on the total number of citations in a subject field, using Scopus data. es to journals, authors or documents — and serves as a good jumping off point for further discussions around metrics. 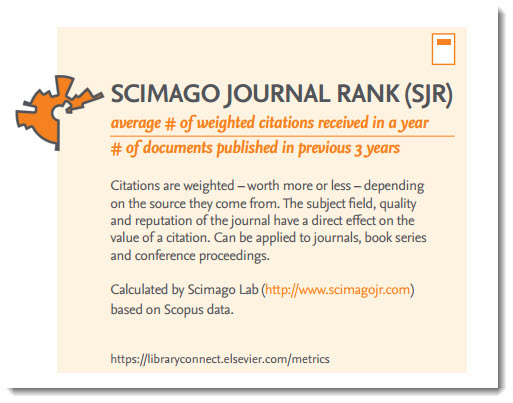 To add a bit more context regarding their specific relationship to Scopus, we will be looking at individual cards and providing the Scopus connection, starting with SCImago Journal Rank (SJR). 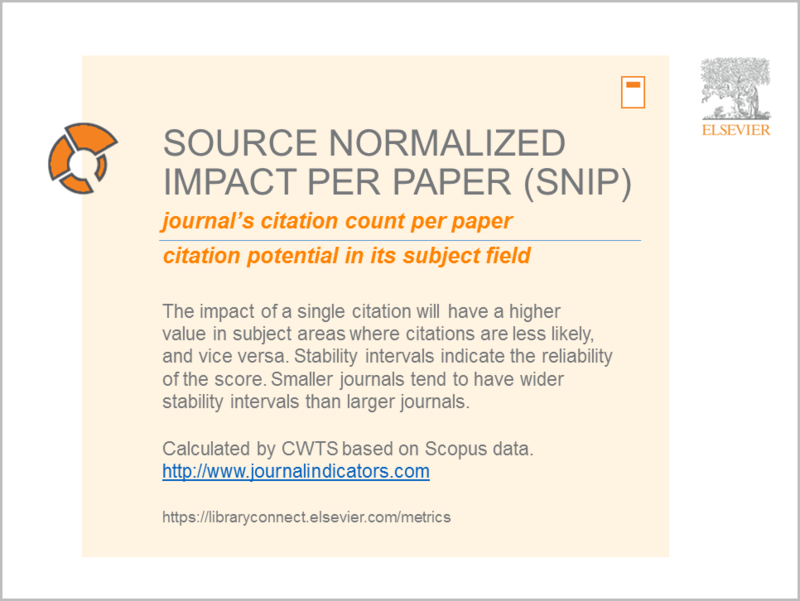 As stated in the card, SJR weights citations based on the source they come from.The subject field, quality and reputation of the journal have a direct effect on the value of a citation. We are pleased to announce that the ShanghaiRanking Consultancy (SRC) is using Scopus data and metrics from SciVal analytics for its Global Ranking of Academic Subjects 2016. The recently released ranking ranks global universities in 7 engineering subjects, including Chemical Engineering, Civil Engineering, Electrical & Electronic Engineering, Energy Science & Engineering, Environmental Science & Engineering, Materials Science & Engineering, and Mechanical Engineering. This new subject ranking continues the SRC’s use of transparent methodology and third-party data. Ranking indicators include those measures of research productivity, research with high quality, research with top quality, average global research impact, extent of international collaboration, extent of academic-corporation collaboration, researchers with global academic influences, and academic awards. Today, April 22nd is Earth Day and we celebrate this day with a joint SciVal and Scopus infographic. Now in its 46th year, Earth Day aims to promote a healthy, sustainable environment, address climate change and protect the Earth for future generations. In 2015, Elsevier’s Analytical Services team in collaboration with SciDev.Net wrote a report about the global research landscape that surrounds the United Nations Sustainable Development Goals. The Sustainability in Science report focused on 6 key themes, one of which was the “Planet”. In celebration of Earth Day, we used the same search terms for the “Planet” theme in both SciVal and Scopus to take a look at the researchers, institutions and countries working in sustainability science. Check out the infographic available now on our info site.